Updated April 7, 2019 | Written by Susan Chai, Esq. Use our attorney-drafted Partnership Agreement form to detail the terms of a general, limited, or limited liability partnership. Document the transfer of benefits from an original to a new business partner. A contract between two or more parties who want to do business together. Establish changes to the terms of an existing partnership. The Basics: What is a Partnership Agreement? What Should be Included in This Agreement? 1. The Basics: What is a Partnership Agreement? 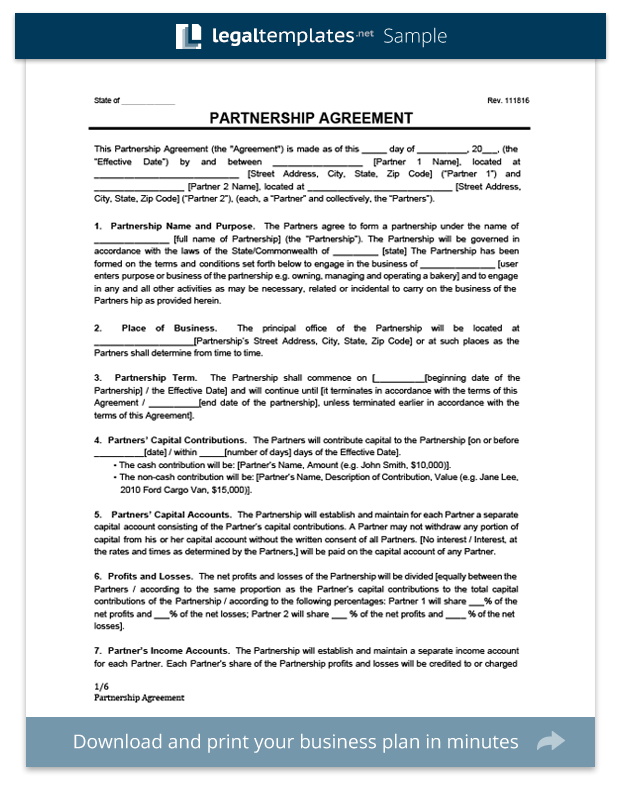 A Partnership Agreement is an internal written document detailing the terms of a partnership. A partnership is a business arrangement where two or more individuals share ownership in a company and agree to share in the profits and losses of their company. In a general partnership, all of the partners are on equal footing. They have equal rights and responsibilities, and each individual partner can act on behalf of the agreement as a whole. They share in the profits, but they also share in the losses. Each individual partner is also personally on the hook for any actions of the team – this is called joint and several liability. Here, the partners are on unequal footing. On one side is the general partner, who manages the business and has the same rights and responsibilities as the partners in a general one, including joint and several liability. On the other side is the limited partner – or silent partner – who contributes money, but is not involved in the day-to-day of the business. The limited partner is not personally on the hook for the actions of the partnership or the general partner. This is a hybrid between a partnership and a corporation. None of the partners are personally responsible for the liabilities of the others and the other partners beyond their assets in the partnership. The partners can choose how much they want to contribute and how involved they want to be in the business. Limited liability partnerships are a more formal structure and require registration with the state and usually a written agreement as well. Their use is also limited in certain states to professional partnerships, such as lawyers and accountants. 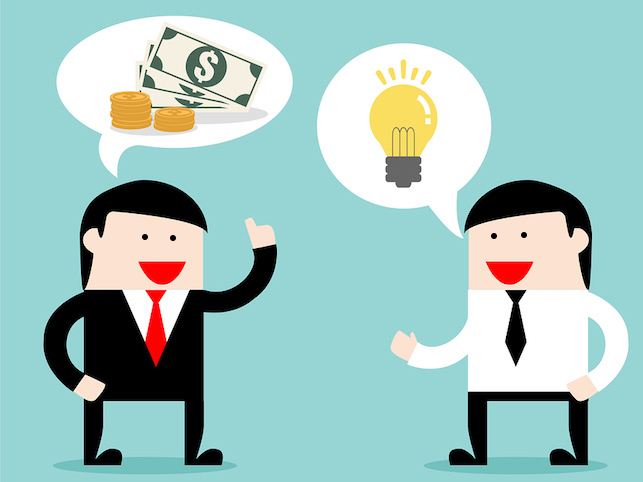 An alternative business structure to a partnership is a joint venture. If you’re interested in creating a Joint Venture Agreement, first learn more about joint ventures. The sample partnership agreement below details an agreement between the two partners, ‘Emma M Johnson’ and ‘Lynn D Crockett.’ Emma M Johnson and Lynn D Crockett agree on the establishment and terms of the partnership. Any arrangement between individuals, friends, or families to form a business for profit creates a partnership. As there is no formal registration process, a written Partnership Agreement shows a clear intention to form a partnership. It also sets out in writing the nuts and bolts of the partnership. Investors, lenders, and professionals will often ask for an agreement before allowing the partners to receive investment money, secure financing, or obtain proper legal and tax help. You could face significant financial consequences if you don’t have a Partnership Agreement before entering into a business relationship. 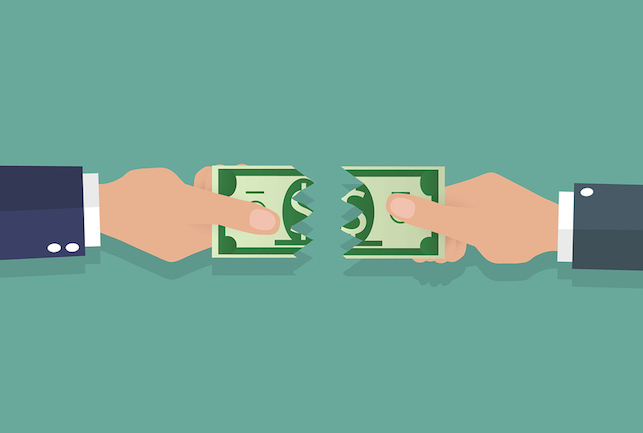 Without this Agreement, your state’s default partnership rules will apply. For example, if you do not detail what happens if a member leaves or passes away, the state may automatically dissolve your partnership based on its laws. If you want something different than your state’s de facto laws, an agreement allows you to retain control and flexibility on how the partnership should operate. Most states have adopted the Uniform Partnership Act (1914) or Revised Uniform Partnership Act (1997). You may also be subject to unexpected tax liability without an agreement. A partnership itself is not responsible for any taxes. Instead, a it is taxed as a “pass-through” entity, where the profits and losses pass through the business to the individual partners. The partners pay tax on their share of the profits (or deduct their share of the losses) on their individual tax returns. Without an agreement that clearly spells out each partner’s share of the profits and losses, a partner who contributed a sofa for the office could end up with the same amount of profit as a partner who contributed the bulk of the money to the partnership. The sofa-contributing partner could end up with an unexpected windfall, and a large tax bill to go with it. This agreement also allows you to anticipate and settle potential business conflicts, prepare for certain business contingencies and clearly define the responsibilities and expectations of the partners. Here is a chart of some of the consequences individual members may face if there is no written Partnership Agreement. Read this article from Entrepreneur discussing the importance of a having a written Partnership Agreement. Each party can contribute different resources of value to make the business partnership worthwhile and robust. Any group of individuals who form a business partnership, whether it be family, friends, or random acquaintances off the internet, should invest in a Partnership Agreement. This agreement allows individuals more control over how their partnerships are run on a day-to-day level and managed on a long-term strategic level. For instance, state default rules often assume that each partner has an equal share of the partnership, even though they may have contributed different amounts of money, property, or time. If you want something different than the default, this agreement allows you to divide profits and losses equally among partners, according to each partner’s contributions or a according to your own percentages. A limited liability company is a more formal business structure that combines the limited liability of a corporation with the tax benefits of a partnership. If you’d like to find out more, read our article about limited liability companies. 5. What Should be Included in This Agreement? You must also make sure to register your partnership’s trade name (or “doing business as” name) with the appropriate state authorities. Thanks for this informative post. I’m actively seeking a credit partner (someone who has good credit which can be used to obtain unsecured loans) for my business. My question is whether any of the agreements above would apply to my situation?